VITALITY RUN HACKNEY HALF MARATHON | London. Heat. East London. Running. Olympic Legacy. 13.1 miles. Goals. In an attempt to be organised, I prepped and packed my kit the night before as well as planning my journey in advance. It was an early 9am race start…on a Sunday so transport options were limited. I fuelled up with avocado on toast (bread baked myself the day before!) before heading out the door to get the bus to the tube station. However, when I got to the tube station, it was shut! Sh*t! I power walked down the road and round the corner to the bus stop to hopefully get my journey going! As I turned the corner I saw the bus making moves to leave and started running / waving / looking like a crazy girl in tiny shorts at 7am on a Sunday morning?! Either way, the bus driver stopped for me…for which I am very grateful! All’s well that ends well and I made it to my destination, via a 20 minute walk to the village from the nearest station. Between a few signs placed by the race organisers and the droves of people looking like an army of ants making their way to the race village, it was pretty easy to find! 9am race start. I arrived at the race village just gone 8am and after finding where I needed to be, depositing my bag and sorting my race number out, it was 8.50am. I didn’t receive any safety pins in my race pack and had no time / did not remember to pick any up before race day! Luckily, others came more than prepared so I was sorted! I made my way to the race start where there was some confusion about where I could start so I decided to just start in a really fast pen so I could just get going sooner rather than later. That pen was the sub 1:45…I figured I might be able to run this race in 2 hours. I hadn’t figured it was going to be so hot though. Once the wheelchair racer and elites got going, the rest of us were not far behind! I started running with the clock at around 2 minutes! ROUTE | Hackney Marshes. Hackney Central. Hackney Empire. Broadway Market. Queen Elizabeth Olympic Park. London. 2014. The first km was interesting – I felt like I ran slow but feedback told me it was a 5 min km which is super speedy for me. I attempted to slow down a little, and averaged about 5 min 30 for the next few kms. This all brought me in nicely to a 1 hour 10km, just about the half way point. I was still good to go by this point – I’d seen Nkeiruka and Ogechi marshalling, I’d been taking in the sights as that part of London was pretty new to me and I was feeling good! I worked hard on keeping hydrated all week ready for today, and packed a small bottle of water in my race belt along with my energy chews. I picked up water at the first water station (around the 5km mark) and then again at the 10km mark. It was a little difficult to tell as the signage didn’t always match what happened! The mile markers were dubious …I didn’t see one for a long time at the start…then I remember seeing a sign saying water ahead…but that water was not there?! I was relieved I had brought some along with me so when I picked up the water provided I could drink some and spray the rest on my body to help cool down. Post 10km now things started to slow down a little. The heat wasn’t letting up, shade was minimal and my lack of training started to show. At 15km, my legs pretty much wanted to give up! The flat as a pancake route (as quoted by race organisers) didn’t help in that it wasn’t what I would consider flat! There was nothing I could do about this now though…I just had to figure out in my head what I needed to do to finish…with a PB! Somewhere in here though I saw Nkeiruka and Ogechi again, as well as Chi-Chi which really put a spring in my step! I stopped to say hi and shove some energy chews down my throat to get me to the end…then I was off again! 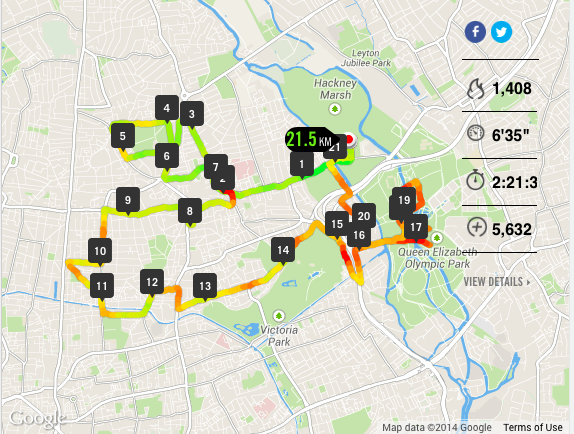 My Nike+ app was confusing me as the voice feedback only ever gave me an average pace – trying to do maths when running a half marathon is not really a good idea! I think I got confused and thought I had more time to spare but soon realised that around 17.5km (where I had hoped to have reached after 1 hr 45 mins) I was not gonna hit my 2 hour prediction. Then I had to fight for 2 hrs 15 mins. Huge shout out to Shameek of Run Dem who I spotted in the “last mile”. We had a little chat whilst running and he pepped me up to finish, to get that PB I was aiming for. Two more turns he told me…so…one…. …. ….two… and there was the finish line, full of people cheering everyone in! I mustered up some energy…heard my name being shouted (Thanks Jen!) and powered through to the end!! The clock read 2:24 summit. The best outcome of the morning had to be the fact that I achieved a PB! 2:21:16 …just 6 or 7 mins off my first ever (and only previous) time but considering everything…the heat… not as much training as I should have done… I think I did pretty darned well!! I took a deep breath…then spotted Alicia at the sideline with a bottle of water ready for me! I hadn’t had a chance to confirm with Alicia if she was coming down and spent part of my run wondering if she would! So when I spotted her, I was soooo happy! I went on to grab my medal…my goody bag…. then join Alicia’s camp to cheer some finishers in! We were there for a while so saw many broken, tired, runners make it to the very end…I spared a thought for those I had seen collapsed at the side of the course but each and every one of them were being well tended to by route marshals and medics. *I personally didn’t have an issue with hydration but it seems many others did. A good call would be to provide more water on route. *Improve the placement / visibility of the mile markers. Maybe include a way of using km markers also?! In addition, use more pacers…I saw one pacer the entire time I ran….at the start and never again! Having 2 -3 pacers per group would mean less crowding and more awareness for those running. 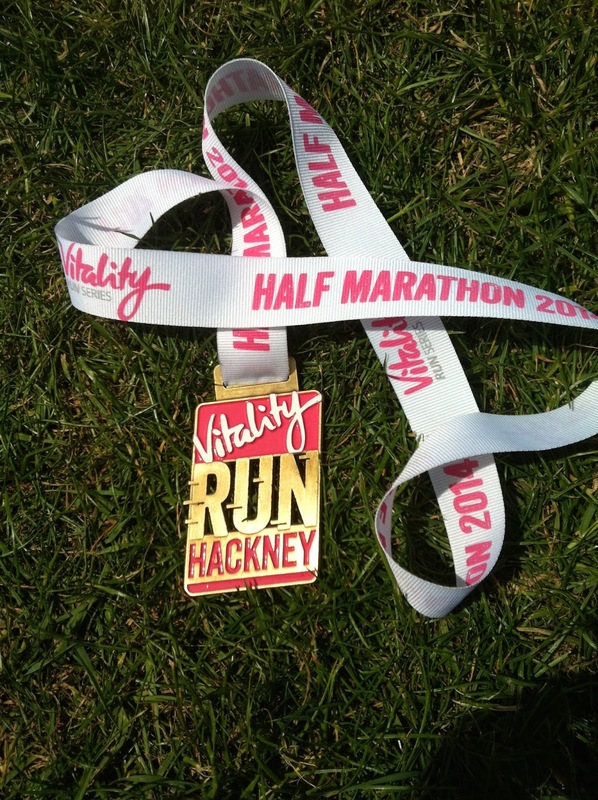 Those interested in registering for the 2015 Vitality Run Hackney on 21 June 2015 can register their interest at www.runhackney.com . Well done on the PB! It was a tough day, the heat was intense. The water stations needed to be bigger and those pouches are rubbish, I got a dud at the last station which meant I didn't have water for the last 4 miles or so! Overall for first time of the event though I think they did pretty well. haha! those pouches were funny! they a lost drowned me when I squeezed and the water shot straight to the back of my nose / throat!! then once when I tried to splash myself it shot the other direction and splashed another runner! …but I did like them more than cups of water or bottles with screw lids. A little bottle with a sports lid would have been great but not quite as environmentally friendly I guess!! and Thank You! …hope the run went well for you too! Will look out for your write up!